HOLLAND (US) - Recognizing a void in the marketplace for process-critical flexible screw conveyor systems, NBE introduces its line of application-specific flexible screw conveyors and hoppers built for harsh applications and demanding environments. NBE flexible screw conveyor gear drives and motors are specified to ensure optimal output torque and motor horsepower; this combination brings maximum power and conveying efficiency to the application. 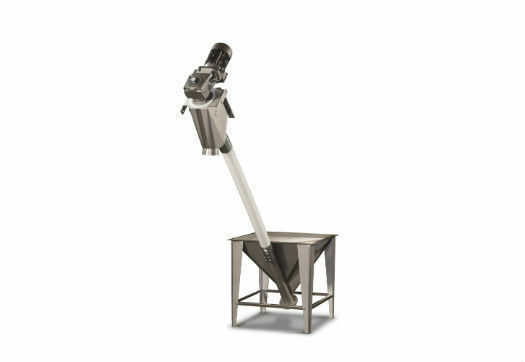 The conveyor discharge head is 12 gauge 304 stainless steel, formed and welded with continuous-weld seams that are ground to a No. 4 finish and hand-burnished to eliminate the gaps, joints, bolts, and resulting material accumulation common with the bolt-together, sheet metal construction of commodity products. NBE flexible screw materials of construction and application-specific flight designs enable sustained conveying, at designed capacities, of even the most rugged materials and rigorous bulk densities. Screw flight designs include: 3/8-inch thick, wide-face flat or beveled flights; 3/4-inch diameter round-bar flights; or 1/2-inch square-bar flights all available in multiple O.D., I.D., and pitch combinations. To protect crucial operations from the early wear of thin-wall screw casings, NBE 1/4-inch thick casings are twice the thickness of typical alternatives. NBE 11 gauge stainless steel or carbon steel casings ensure confident operation; whether conveying pharmaceuticals or mined minerals. NBE flexible screw conveyor hoppers are built to specifications that will withstand tough duty cycles. Each standard hopper has 12 gauge 304 stainless steel walls; 10 gauge 304 stainless steel legs; and 7 gauge stainless steel component stand-offs for long-term performance assurance. NBE hopper designs also have steep-slope sidewalls; sheer-drop material feed guides, and a flangeless conveyor intake that draws in material and eliminates the bridging, ratholing, and cleaning access problems associated with typical flange-style designs. National Bulk Equipment also provides flexible screw conveyor system controls and integration, material flow devices, and multiple gear drive and motor combinations. More information about National Bulk Equipment, Inc.